some of the changes in the latest cycle are definitely significant. Grade 80 reinforcement, having a minimum yield strength of 80,000 psi (550 MPa). special moment frames and special structural walls. concerning temperature and shrinkage reinforcement in post-tensioned slabs. revised to be fully consistent with those of ASCE/SEI 7-10.
practical experience with post-tensioned concrete members. been eliminated from Section 18.6.2.1 as being text-book material. overstrength factor, ?0= 3, of the intermediate moment frame. Development of wall horizontal reinforcement in confined boundary element5. piers having (lw/bw) > 2.5.
involvingE, with *E *multiplied by ?0 (Section D.3.3.4.3(d)). anchor failure in shear is not an option anymore. anchor in shear,Vb, to account for the larger diameter anchors. 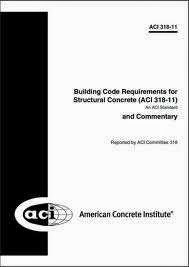 calculation of concrete breakout strength using the provisions of Appendix D.
is now gone from ACI 318-11.
inspection requirements, and certification of adhesive anchor installers. Separately, a certification program has been established.